High school age Bee Quest 2015 participants working with the Baltimore City Community College Refugee Youth Project completed “Chemosenory Art,” now availble to be viewed online. Neiman Marcus Group “Heart of Giving” Foundation funded the art project proposal submitted to NutriBee by six Baltimore high school students comprised of refugees from Ethiopia, Democratic Republic of Congo and Tanzania. Together with their Bee Quest coach, AmeriCorps artist Clare Shreve, they told the stories of their amazing journeys through art. 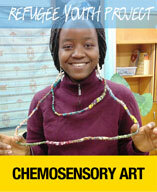 Their completed interactive online project is titled “Chemosensory Art” is can be viewed online at NutriBee.org/BeeQuest where it is inspiring middle school students from America in healthful nutrition.